Rahul Gandhi : Failure-Saga Continues !! » Soham Whispers But Loudly !!! What to do now??.. My COLD Theories !! Rahul Gandhi : Failure-Saga Continues !! He is a grandson of one of the most dynamic leaders of India Mrs. Indira Gandhi, son of one of the most innovative and revolutionary Prime Ministers of India Mr. Rajiv Gandhi and king(PM)-maker Mrs. Sonia Gandhi.. In India, these qualifications are more than enough to open the gates of a royal entrance into the world of Indian politics and hence why should Rahul Gandhi lack behind in getting all the benefits even when he has spent almost half of his life in USA.. 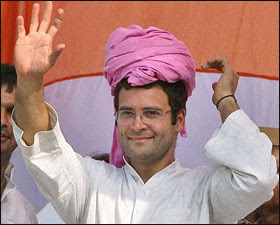 He entered the politics in a grand style..He directly contested ‘Lok Sabha'(Indian Parliament) election from Amethi.. Amethi has been a Gandhi-parivar(family) constituency since last two decades and as expected, he won the seat with a landslide victory with over 1 lakh plus margin of votes…He was new…He was novice..he was naive..He had no prior political experience..He was controversial…He was not a good orator..But still he won in a grand style..People of India do suffer from ‘Fair-skin obsession’ syndrome…This syndrome provided the trick for his victory..
For some years, he was in a latent state..He was not in any news…but later last year, he was promoted as a star campaigner for UP(Uttar Pradesh) assembly elections..He was a prominent figure in a high profile Congress campaign..This election was a matter of respect and pride for Congress..Rahul Gandhi got tremendous response from the people in his road-shows and in all the ‘Sabhas’ he carried out..Congress was relying heavily on him ,expecting a miracle from him and he too was proving to be a decisive force which can make Congress reborn in UP…‘Fair-skin obsession’ syndrome might do the trick again ! !..But when the results came, Mayawati of BSP won with a record break margin grabbing 200+ seats while Congress secured only 22 seats out of total 403…Congress was mere forth after BSP, SP and BJP…It even feared its mere existence in India’s largest state..Rahul Gandhi’s charisma failed but he was saved by stating that this is his first attempt and he still deserves a second chance..
Then came the all-important and the one which the whole world was observing – Gujarat Assembly Election..He received terrific response from the people where ever he went be it Ahmedabad, Surat or other rural areas..Again same ‘Fair-skin obsession’ syndrome of India ! !…Congress tried their level best to beat Moditva wave but again Rahul Gandhi failed to convert the huge crowd turn-out into the votes for Congress…Narendra Modi won with a two third majority and setup a great example that good governance is not at all a bad politics…You can even win an election on the basis of development and good work…Rahul Gandhi was again saved by stating that Gujaratis are a special breed different than other Indians who are insufferably communal and quasi-fascist…Wow!! what an excuse!! And now, it became a prestige issue for Rahul Gandhi and Congress when Karnataka assembly election were declared…The results are out..BJP has won 110 of total 224 seats and they are going to form their government for the first time in southern India..They have opened an account in south now…No reasons have been given till now from Congress about the failure…I guess they are tired now !! .. I think Rahul Gandhi needs some time…He needs some experience..People still don’t see that ‘Rajiv Gandhi’ image in him..He does not look that fire-power and fire-brand leader like his father…He might be getting a lot of response and attention but he did not succeed in converting all those into votes for his party…And that is a pity story for him…He is projected as a Prime Minister candidate for the next elections but seeing all his failures, I am a bit skeptical whether I will vote for him or whether I would like to see him as PM of our country !! Way to go Mr. Rahul !! Other than that its the same old typical indian politics straight from the garbage can !!! Well, I’m not really sure it’s the Fair Skin Syndrome that gets him the attention. I don’t think we’re that obsessed with fair skin. The thing that works for him is his surname, Gandhi. When you’re from the first family of Indian politics, it’s expected that you’ll be noticed. However, being born in that family and having politicians as parents doesn’t mean Rahul can become one too. So far, I haven’t seen anything in him. Whatever he does seems to be pre-planned. He’s not really spontaneous and somehow doesn’t reach the people’s hearts. They’ll listen to him, but they’ll vote for someone else, which is a shame. But only he can’t be blamed for those losses. The country and everybody as a whole is not very happy about the way Congress has handled things. It was the same with BJP before Congress came to power. The thing is that it’s almost impossible to satisfy and make everyone happy with every other party breathing down your neck. The nuclear deal not happening was the Left’s fault but it will be blamed on the Congress. People are a little impatient. They think that electing new people would help things, which, unfortunately doesn’t happen. And Rahul Gandhi, well, I wouldn’t be happy to see him as Prime Minister. Very good analysis. One thing is for sure that he has indeed tried very hard to be a part of the front-line politics in India. His rallies and speeches in Gujarat were quite rigorous. But I think what Congress needs is some concrete evidence of good governance across states. They have been losing state after state and the path to the next election for them is filled with difficulties. The warning that u r seeing at the beginning of my post is specifically put keeping you in mind ..
Indian Politics is not that bad dear !! ..
Ish, it surely is ‘Fair-Skin Obsession’ syndrome .. First we got impressed and influenced by Britishers and because of our that very syndrome, they ruled us for 200+ years .. Now it’s sonia gandhi – an italian is rulling us…Sonia is no indian for me .. She was, is and will be Italian forever..Let us organize a footballmatch between itly and India and let us see who she cheers for??.. By the way, Hilary clinton is free now as she got defeated by Obama…I think she should apply for congress president-post and she can be a PM maker in next election..We indian can surely accept her ..After all she is fair – Gori !! Delhi and MP are next in queue .. It is predicted that BJP will win delhi because of anti-incumbancy wave ..
MP will be a tough battle .. Uma Bharti might prove to be a trump card .. Whether she joins BJP or she contests from her own party .. COngress might get benefited by anti-incumbancy factor !!.. But it surely will be interesting !! Yeah not interested in Indian politics or any politics for that matter BUT thank you for the heads up and thank you for not imposing your “words of wisdom” on how one should be aware of politics and blah blah. This is the primary reason that India is lagging behind .. Youths, like you, are never intereseted in Indian Politics, they even do not cast their votes during elections and then they abuse our politicians for India’s bad situation .. Mind well – you have to be in the system to change the system ..
You have to be in the system to change the system. Bt casting a vote is becoming more like choosing the lesser of two evils. Gujarat is one of the few exceptions where u can judge accomplishments and vote accordingly..